This house is placed on a mountainside, surrounded by pine trees and vegetation. 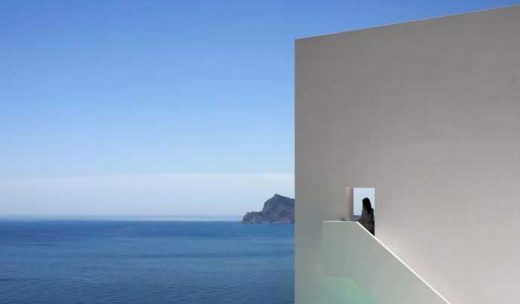 The dwelling is composed of two overlapped bodies that are set back in order to generate a play of light and shadow. This play is reinforced by the openings in the floor slabs, which lean on a stone base adapted to the steep slope of the mountain. The design adapts to the natural topography of the plot, making the auditoriums descend towards the southwest and putting the main access areas on the northeast and southeast edges of the site. 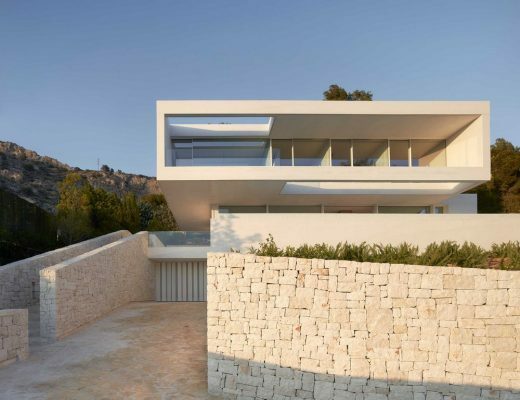 These accesses are organized and oriented to afford the best views of Moraira and the sea, in the process emphasizing the building’s ‘connective’ role. Spanish Architecture Competition : the Plaza del Raval de Sant Josep. The project solves an urban void in the middle of a historical village, part of a sequence of 3 urban voids, which is used once a year as a folk party including bulls. Perfectly standardized, sport architecture has become more universal than international style. Track length of 400 m, 36.5 m radious. 1.22 m each lane, just data, without any fissure to let your imagination soar. The architects have added to the conventional track an alternative one, amateur and funny, raised and tree-dimensional. It goes off on a tangent, covers the changing rooms and returns to the coventional track. As new ways are available for athletes, spectators get involved in the sport activity, seated in-between this two tracks.